A long fork may look cool to those of a certain aesthetic persuasion, but it dramatically reduces the bike's responsiveness and maneuverability. The fellow above is no doubt suffering from a severe case of Chopper Flop. Does the "Rule of Inverse Proportionality" come into play here? And no, I am not saying that because of the cliche about Asian Men: I think that about all men I see on "Easy Rider"-style bikes. Also, with the admittedly limited information I have I would guess that the inverse proportionality rule applies more to exhaust noise than to fork length. "correct" trail, so that flop is non-existent. 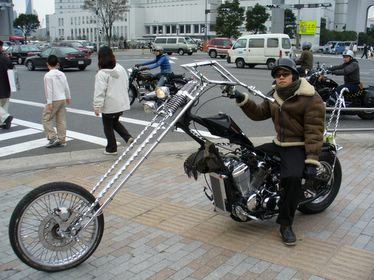 The reality is that modern chopper builders design their front ends to cheat the front end geometry for more-acceptable steering behavior when using extended forks, by using triple clamps which attach the fork tubes at a greater angle than the steering head. This is just a band-aid for an inherently bad design. They are still a flop. Yeah, I had read that, and can't help thinking that they're the ones being "defensive". Basically the fact that the geometry used on modern choppers (meaning since as early as the 60s) achieves acceptable steering pretty much negates the premise they've based their whole site on. They admit this, and then try to weasel out of it by saying it's still a "bad design" and "cheating"(by whose rules?). It would be stupid to judge a truck by sportscar standards, and a sportbike would be a "bad design" if used for motocross. Cruisers are great for what they're built for. Those guys are trying to work out their inferiority complexes by putting down something they don't understand. Meanwhile, I ride comfortably, look good, and prefer to spend my time enjoying the ride rather than obsessing over what others ride. I'm off to Izu this weekend for some hanami-touring and onsen action. I'll probably have a post on it sometime next week. And I'm not about to tell anyone else what to ride, either. If super-long forks are your thing, go for it. Beyond a certain point, however, trading off performance in the name of style is risky  although different people will have different opinions about where that point is. Sorry, I should have clarified too. My criticism is directed at the Chopper Flop guys, not you. different people will have different opinions about where that point is. That's the point, isn't it? The whole bike thing is about freedom, and we all get different things out of different aspects of the riding experience. I have a custom triple tree, slightly extended forks, and lowered suspension, but all of those mods are moderate becasuse I like twisty mountain roads and that's as far as I can go and still ride the way I want. I would certainly never judge someone for putting the balance in a different place. That's the point, isn't it? The whole bike thing is about freedom, and we all get different things out of different aspects of the riding experience. "Also, with the admittedly limited information I have I would guess that the inverse proportionality rule applies more to exhaust noise than to fork length." So true, Big Ben , so true! I live just off of Lake Shore Drive in Chicago, and I've never in three years of living in this apartment, been able to sleep with the window open. No breeze for me. Why? Because of the Biker Boyz on their "crotch rockets". I swear, I've been woken out of a wine-induced coma by those things. Oh well. Even paradise has a it's irritations!